Villagers in Gwaltoili, Uttar Pradesh, were bewildered when they stumbled upon several Buddhist sculptures, including a 100 kg headless statue of Lord Buddha, while digging in a private farm. 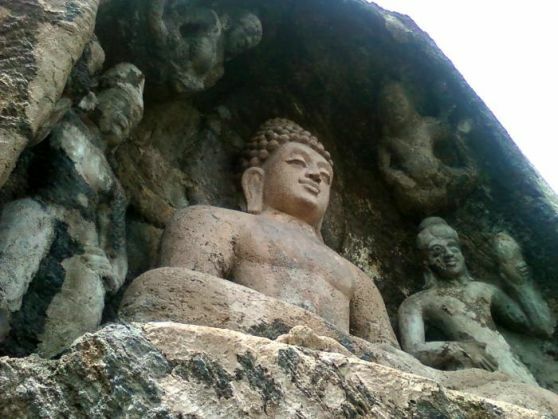 The Times of India has reported that the sculptures and the broken idol of Lord Buddha belong to the Kanishka era. According to experts, the Buddha statue is carved out of a yellow stone and weighs around100 kg. It was found along with 11 other small and big idols from the fields of Manoj Yadav. SHO Kotwali said, "As the statues are precious, we have informed senior officers who will contact the Archaeological Survey of India (ASI) officials so that they are properly preserved." The villagers have kept the huge idol of Lord Buddha under a tree and have started worshipping it. Some villagers have taken away a few of the other 11 statues found.